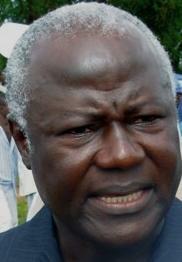 ERNEST KOROMA CALLS FOR PERIOD OF FASTING AND PRAYERS - WHAT HAS HE SEEN THAT IS HIDDEN FROM THE EYES OF MERE MORTALS? "Hey you sinners and people of no moral fortitude. The Lord has appeared to me in a vision. Indeed the Good Lord speaking through the mouth of Sister Veronica Conteh has directed me to tell you to fast until July 5. And by the way, just to show how serious I am about it, you should have started your period of prayer and fasting as from the 8th of April though I'm only telling you now. Do not blame me sinners - it is the global." Ernest Bai Koroma is well advised to take his history lessons seriously and learn from those yet alive and those who though gone to the great beyond left testimonies teaching all those who care to listen that God is not mocked. Fugitive Johnny Paul Koroma, apparently so well admired by President Ernest Bai Koroma tried to use the name of the Good Lord in vain and got his due reward. Here was a man whose operatives rained murder, havoc and sheer terror on the people of Mabaylla in the east of the city, put the blame on the Nigeria-led ECOMOG troops who had so far prevented him from murdering civilians on a grand scale and at the funeral of his victims dared to invoke the name of the Good Lord. Which reminds us of something regarding Mabaylla. AFRC activists and paid journalists were quick to attack one former BBC reporter in the capital when he dared mention later that it was the AFRC/RUF that had carried out the murders and mayhem. One of them, now......something in chief and in journalism for fifty years even went as far as to state that Victor Sylver was bribed by the SLPP to say that it was the AFRC that had carried out the atrocities in which civilians were murdered using RPG's and automatic weapons. Well - Kabala, Kabala - the mille kilo is now parked and ready. Let Ernest Bai Koroma now call for an international and independent investigation into those early September 1997 killings!!!! And back to this prayer and fasting flight of fancy of President Ernest Bai Koroma. We would advise that he kindly takes his mind back to one of those SLBS TV shows in the early days of the junta - the AFRC/RUF coalition of evil otherwise known as the beasts that is. Remember how viewers were shown members from one of the "spiritual" churches heaping praises on the "Teerman" and expressing just how blessed he was and that nothing will stop his glorious reign? Take your mind back to one of the church members saying on TV of how she had had a wonderful dream about the Chairman? Remember that when pressed upon to reveal her dream, this lady coyly replied that she would make this known to the Teerman when they were alone or certainly not on TV or words to that effect? President Ernest Bai Koroma learn from the lessons of history. Be reminded that the Good Lord is not mocked.